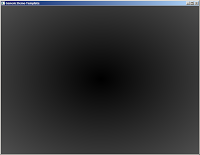 In this post I'll have a small tutorial on creating sort of a plasma-esque interference pattern in GLSL. I've been interested and in awe of the magic demosceners do in their art, and about two years ago I wanted to achieve that myself. I never managed to finish an intro myself, but I got a bunch of "oldschool" effects done. 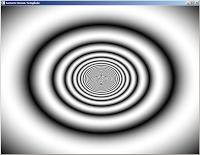 The one I'm most proud of is a simple interference pattern. To the more mathematically able of you this blog post probably won't offer much, but for someone as slow as myself it's important to explain everything in detail. 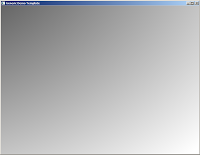 The fragment shader doodles graphics on a flat, square plane. Lights are ignored for now. 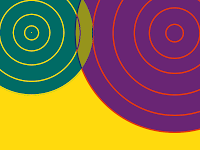 In the 0.0 - 1.0 coordinate space the circle is now centered. I reformatted the shader a bit to make it easier to read. It's looking cyclic now. Time to add movement! 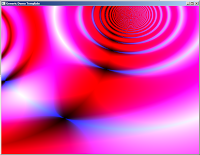 Parameters t and v are time and velocity: Time is given by the main program to the shader, and velocity is used to control the speed of the wave. 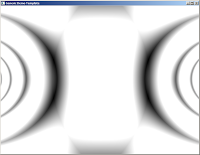 The effect cannot be shown as a picture, but the wave now moves inside and out the picture. I have taken our original full formula and assigned it into two variables W1 and W2 (waves 1 and 2). 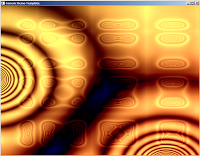 The coordinate parameter is what defines where the wave will be located, and must be different for the two waves. Now comes the fun part: Let's add these waves together! That's VERY different. As the waves are coming at different angles we are getting these cool cells in the pattern. 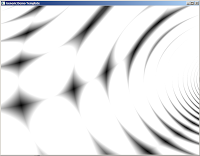 It's something resembling a moire effect as well. Ok, let's get wilder: Both waves move, and we'll add more colours. We are using different times to make the movement seem less symmetrical. Note that all the sine functions are now turned into absolute values: Sine produces values from -1 to 0 half the times, and those offset our waves outside the 0.0 - 1.0 rectangle. By always keeping the values absolute the wave is always visible. I was mostly experimenting when I formulated this version. It's slower than the one written for this tutorial since I wasn't optimizing then. Also, this was made for a 4k intro. Have fun hacking!